Sir William Emerson was born the son of a silk manufacturer in Whitechapel, and educated at King's College, London. Having trained initially with W. G. Habershon and A. R. Pite, in 1865 he became the pupil of William Burges, and, while still in his very early twenties, was sent out to India with plans for a new school of art in Mumbai. The plans never materialised, but since he had family there, he stayed on. His first big commission was for Mumbai's Crawford Market, a wonderful Gothic heap showing Burges's influence, with its cast-iron lamp-brackets in the shape of twining reptiles, and with a fountain executed by Kipling's father, John Lockwood Kipling, who was also responsible for the bas-reliefs on the main entrance. At this time the older Kipling was Director of the Sir Jamsetjee Jeejebhoy School of Art in Bombay, an institution which strongly promoted the idea of bringing together design elements from both Indian and Western traditions, and this must have influenced the young Emerson too. He continued to like Gothic, which he used for churches like All Saint's Cathedral, Allahabad; but "for secular buildings he championed the eclectic combination of neo-Gothic planning and construction with Eastern, so-called Indo-Saracenic, details. He did not believe that purely European buildings worked satisfactorily in the East" (Marsden). After Emerson's return in 1869, he established an office in Westminster, and, despite continuing to do his best work in India, eventually became president of RIBA. He received a knighthood in 1902. 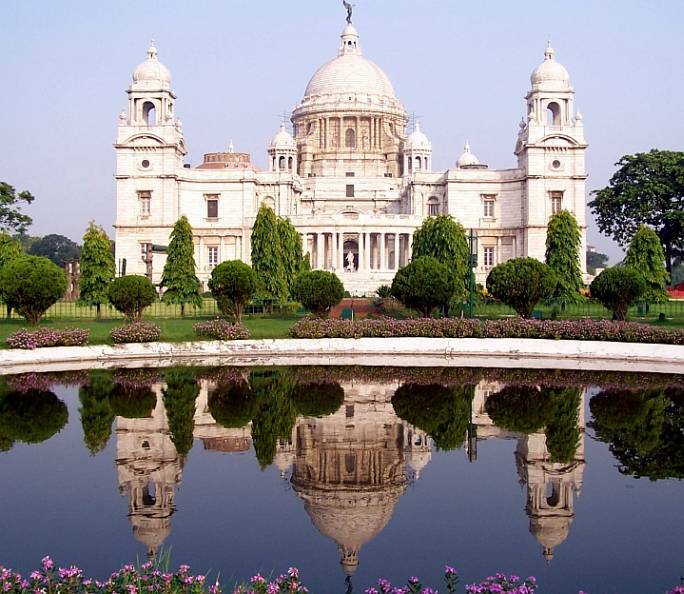 His major buildings in India and his various official roles at home, such as advising on the competition for improving Buckingham Palace, heading the Royal Architectural Museum and bringing it together with the AA (Architectural Association) and so on, made him the ideal choice of architect for the Victoria Memorial Hall in Calcutta. This has been called "the most potent symbol of Empire erected anywhere in the world" (Davies 210), or even, as Jan Morris puts it, "Britain's answer to the Taj Mahal" (4). — Jacqueline Banerjee. Marsden, Christopher. "Emerson, Sir William (1843-1924)." Oxford Dictionary of National Biography. Online ed. Viewed 3 September 2010. Morris, Jan. The Stones of Empire: The Buildings of the Raj. Manchester: Manchester University Press, 1993.